Posted on November 16, 2015 by Appropos / This entry was posted in Product Reviews and tagged e-cigarettes, E-cigs, vape, vaping, vaporizers. Bookmark the permalink. At Sunflower Pipes we carry a large number of products from the Stratus vaporizer line. Stratus has products to fit a wide variety of needs all of which are sold at great prices. This article will list the different products we sell, highlighting the specifics of each. The Stratus Starter Kit is designed for use with oil and ejuice. The contents of this kit are a 900mAh battery, 2 CE4 tanks, and a USB charger. The tanks can hold 1.6ml of liquid and the resistance of the device is 2.5 ohms. This is a great product for those looking to get into vaping and need a product specifically to use with oils and e-juice. The fact that it comes with two tanks is great. This allows for the utilization of more than one e-juice at a time. Simply switch between tanks for a change of flavor. Also, the inclusion of this second tank helps extend the time before the search for replacement parts is necessary. Both tanks are eGo style which fit on a wide variety of batteries and are very easy to replace as eGo tanks are a common tank style carried in most smokeshops, including ours, for a low price. The Stratus 2 in 1 Combo comes in the same shape as many of the micro pens in the market such as the Grenco Science MicroG and the Ruby Vape Pen. It can be used to vape either dry herb or waxy oils. 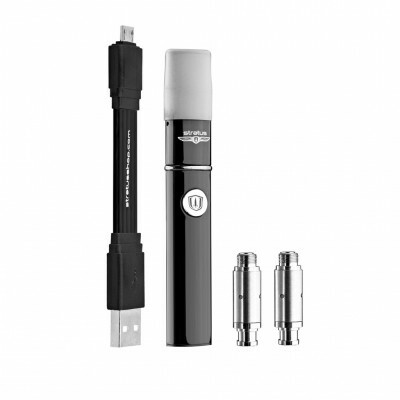 The package comes with a battery, 2 extra ceramic atomizer heads aside from the one already installed, a USB charger, an an instruction manual. These micro pens are really great portable devices. The fact that this one can be used for both dry herb and waxy oils makes it a very versatile piece. The atomizer tops are a little trickier to find than the ones for the Starter Kit, so it is great that it comes with three already included. These devices are perfect for someone who is looking to utilize concentrate wax while also being able to vape herbal product. Their size makes them very portable and easy to carry and use. This device can be used for dry herb, waxy oil, and eLiquid. It comes with a 900mAh Battery, an e-Juice/oil tank, a dry herb/waxy oil tank, and a USB charger. The 3 in 1 model combines the features of the starter kit with the 2 in 1. 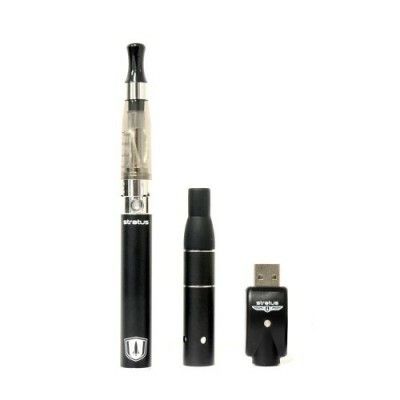 It is a pen style vaporizer, resembling more the starter kit in size than the 2 in 1. The atomizer coil chamber for the waxy oils and herbs is different from the one included with the 2 in 1 kit, making it a little more difficult to find replacement parts for. The e-liquid tank is the exact same as the one included in the starter kit. 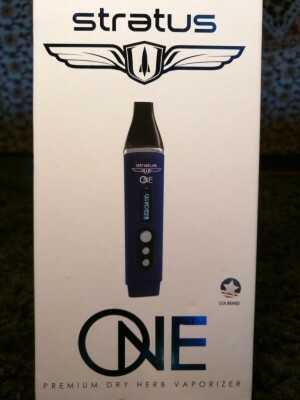 This is a great device for an herbal and wax user looking to quit smoking or for an electronic cigarette user that is also looking to utilize their device to vaporize concentrates and herbs. 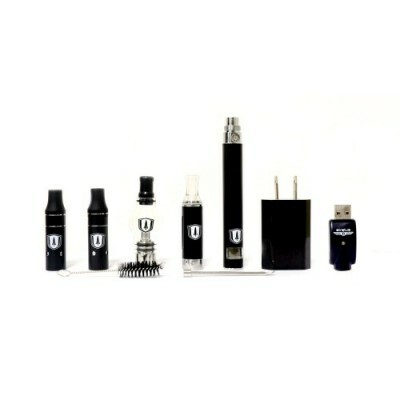 The Stratus 4-in-1 has everything that the last two kits included and more. It comes with a 900 mAh battery which has an LCD display on it, 1 liquid tank, 1 dry herb heating chamber, 1 wax heating chamber, 1 globe atomizer for wax, 2 rubber mouthpieces, a USB wall charger, 1 cleaning brush, and 1 packing tool. The number one improvement that the 4 in 1 makes upon the other Stratus kits is is the separation of the the herb and wax atomizer chambers. This allows for more specific utilization methods, allowing for better taste and efficiency for each. Having different atomizer styles like this for the two substances is common among many other devices in the vaporizer world, so it’s good to see Stratus providing something comparable to these other devices. The Stratus One is a dry herb vaporizer that resembles the GPro or Pax shape and function. It has a ceramic heating chamber and a smart OLED display which allows for precise temperature control. The kit comes with a cleaning brush, a vaporizer tool, a USB cable, a wall charger, 3-silicone mouth tips, and 5 screens. This type of vaporizer is used for vaping dry herb. A temperature is set on the device and herbs are loaded into the oven. The user than continues pulling from the vaporizer without having to press any more buttons until the herbs have been all vaped out. It is a great vaporizer for those looking like an at home use tool that is still small enough to take on the road. It is perfect for session vaping, providing a clean alternative to traditional bowl pipes and water pipes. At Sunflower Pipes we sell a wide variety of Stratus accessories, such as a glass kit and a variety of atomizer coils and ejuice tanks. So, if you’re in the market for a new vaporizer, check out our Stratus line as well as some of our other best selling lines such as Grenco and Aspire.